1 David again brought together all the able young men of Israel – thirty thousand. 2 He and all his men went to Baalah in Judah to bring up from there the ark of God, which is called by the Name, the name of the Lord Almighty, who is enthroned between the cherubim on the ark. “Baalah” – the more familiar name is Kiriath Jearim, where the ark had stayed for 20 years during Saul’s reign. “Called by the Name” – meaning that God owned it. A phrase used elsewhere to indicate ownership. “Who is enthroned between…” – in 1 Chron. 28:2 the ark is referred to as ‘the footstool of our God’ – the footstool of God’s earthly throne. David, recognising the ark as symbolising God’s ultimate kingship and rule, wanted it to be prominent and central, unlike Saul who concealed the ark, among other failures of spiritual leadership. 3-5 They set the ark of God on a new cart and brought it from the house of Abinadab, which was on the hill. Uzzah and Ahio, sons of Abinadab, were guiding the new cart with the ark of God on it, and Ahio was walking in front of it. David and all Israel were celebrating with all their might before the Lord, with castanets, harps, lyres, timbrels, sistrums and cymbals. “Uzzah and Ahio” – sons, meaning more broadly, descendants. They decided to move the ark on a new cart (carelessly imitating the pagan Philistines) but the standing instruction was to move the ark by having Levites carry it by its rings, Exodus 25:12-15, Numbers 4:4-6. This was a strategic error leading to Uzzah’s death when he stumbled and touched the ark, verses 6-7 omitted, 1 Chron. 15:13-15. 12 Now King David was told, “The Lord has blessed the household of Obed-Edom and everything he has, because of the ark of God. So David went to bring up the ark of God from the house of Obed-Edom to the City of David with rejoicing. “Blessed…Obed-Edom” – The Lord had blessed the Levite who had taken good care of the ark, and David’s deduction was that this blessing would come on Jerusalem if the ark was reverentially cared for there. Aware that his own care and reverence had been found lacking, David is leading the procession in praising, celebrating and sacrificing wholeheartedly. 13-14 When those who were carrying the ark of the Lord had taken six steps, he sacrificed a bull and a fattened calf. 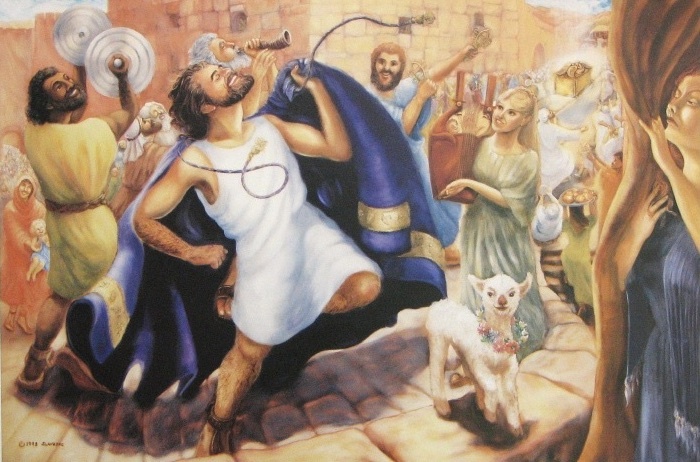 Wearing a linen ephod, David was dancing before the Lord with all his might, while he and all Israel were bringing up the ark of the Lord with shouts and the sound of trumpets. “Those who were carrying” – now the Kohathite Levites are carrying the ark on their shoulders. After a few steps, David consecrates the new phase of the journey in sacrifice. No need to assume he does this every few steps. “Linen ephod” – a priestly garment worn for ministering to the Lord, as the boy Samuel did, 1 Sam. 2:18. “Daughter of Saul” – also a statement of attitude. David was a very different character, which for her undermined her father’s memory. “She despised him” – Michal, a princess, was holding values of dignity and royal propriety about David’s kingship. David had another royal propriety in mind, before the King of kings; his sense of submission to the Lord in heartfelt worship overrode his personal dignity, verses 21-23. 17-19 They brought the ark of the Lord and set it in its place inside the tent that David had pitched for it, and David sacrificed burnt offerings and fellowship offerings before the Lord. After he had finished sacrificing the burnt offerings and fellowship offerings, he blessed the people in the name of the Lord Almighty. Then he gave a loaf of bread, a cake of dates and a cake of raisins to each person in the whole crowd of Israelites, both men and women. And all the people went to their homes. “Blessed the people” – as Moses and Aaron had, long before, outside the tent of meeting, when the glory of the Lord appeared, Lev. 9:23. And as Solomon would at the dedication of the temple, 1 Kings 8:55-61. In practice Israel had lost the experience of having the presence of God with them, under Saul’s woefully disappointing kingship. The Ark of the Lord was out of sight in an obscure place. The faith of the nation was at low tide. Saul was a proud person and everybody knew he was king. David was a worshipful person who exalted Yahweh as the real King of Israel – so that sometimes people forgot that David was set apart to lead, and not just one of them. David made mistakes but he was a quick learner. He recognised that bringing up the ark as the ‘footstool of God’ at the heart of the nation would get everyone looking to God. This led to the Temple, his vision but not his achievement, and looked forward to ‘God with Us’, his descendant Jesus the Emmanuel and a time which each of us would be a temple of the Holy Spirit. Question David didn’t care what anyone thought when he was worshipping God exuberantly. How could you be more expressive, more released, more abandoned to God? “He is Elijah” – the return of Elijah (or one ministering as Elijah did) was one of the last prophecies recorded, Malachi 4:5. As Elijah was the forerunner to Elisha, to ‘Elijah’ would be the new forerunner to the Messiah. It was John who ministered in the “spirit and power of Elijah”, Luke 1:17 and we would say, in the style of Elijah, in being a prophetic preacher and a wilderness-dwelling outsider. Herod was fearful, disturbed by a bad conscience – and superstitious. 17-20 For Herod himself had given orders to have John arrested, and he had him bound and put in prison. He did this because of Herodias, his brother Philip’s wife, whom he had married. For John had been saying to Herod, “It is not lawful for you to have your brother’s wife.” So Herodias nursed a grudge against John and wanted to kill him. But she was not able to, because Herod feared John and protected him, knowing him to be a righteous and holy man. When Herod heard John, he was greatly puzzled; yet he liked to listen to him. John’s imprisonment, in the fortress of Machaerus, is described by the independent Jewish historian Josephus in his ‘Antiquities’. 21-22 Finally the opportune time came. On his birthday Herod gave a banquet for his high officials and military commanders and the leading men of Galilee. When the daughter of Herodias came in and danced, she pleased Herod and his dinner guests. “Half my kingdom” – more of a saying than a promise, see Esther 5:3,6. But keeping up appearances mattered in the company of so many military commanders. 26-29 The king was greatly distressed, but because of his oaths and his dinner guests, he did not want to refuse her. Clearly Herod recognised John’s integrity, moral courage and prophetic gift, vv. 17-20. But, a vain man in the company of military officers and people of power, he felt constrained not to appear weak. So he immediately sent an executioner with orders to bring John’s head. The man went, beheaded John in the prison, and brought back his head on a platter. He presented it to the girl, and she gave it to her mother. On hearing of this, John’s disciples came and took his body and laid it in a tomb. Disciples of John existed for a century or more after his death. He was the last of the Old Testament-era prophets. In practice John was an Elijah-like figure who announced Jesus, made preparations for Jesus by baptising in the River Jordan, and made a way for Hims ministry, preparing people for a Messiah who was expected but not at all understood. He completed his forerunner role a little too well and a little too early, by being executed on a whim at the request of the tetrarch’s wife, who resented him deeply. He died a righteous man; His cousin was to die a worse death on a Roman cross a couple of years later as a righteous man who was also without sin. David’s initiative in bringing up the Ark of the Lord, led to the temple order of worship of the Lord and then to the Lord Himself. John the Baptist’s obedience to his call led to the dawning of an understanding that the realm of God’s rule and realm, the kingdom of God, was starting to be realised. Question Can you think of something you have done for God’s kingdom that didn’t seem to result in much glory but made a preparation for someone else’s contribution? Why is this important? “Praise be” – or “Blessed be” more literally. This follows the style of Jewish prayers that were recited at times during the day. Paul is straight in here with a vital statement of the spiritual identity of a believer in this era of the life of the Holy Spirit. These good things are ours because of who we are “in Christ”. There is an assumption here which we often miss – that there is no disconnection between the “heavenly realms” and our earthly life. Our spiritual blessing and spiritual life is located in heaven, with Christ, influencing our different, but not disconnected, everyday life on earth. 4-6 For He chose us in Him before the creation of the world to be holy and blameless in His sight. In love He predestined us for adoption to sonship through Jesus Christ, in accordance with His pleasure and will – to the praise of His glorious grace, which He has freely given us in the One He loves. “Chose us in Him” – God is outside the constraints of time and space which define us – which makes it easier to understand how He could choose us, at the beginning of creation, in the Son and for our own adoption into sonship. This is not flowery prose but the most profound statement of how God sees us “in Christ” as those who have put their lives under Christ’s lordship. “Praise of His…grace” – because it is unearned and conferred. Our worldview which emphasises merit (and deprecates hereditary titles) makes it difficult for us to simply receive God’s grace in Jesus, without imagining we have worked for His favour in some religious or sacrificial way. “Redemption through His blood” – The first redemption was the nation of Israel released from slavery in the Exodus, with the Passover sacrifice and applying of the lamb’s blood to the doorframes foreshadowing for Christian believers the provision of Christ’s shed blood from His sacrifice of Himself. The redemption now is Christ’s price paid for our release from slavery to sin and independent action. “Made known to us the mystery” – the Holy Spirit gives us the key, enabling spiritual ‘mysteries’ to be spiritually discerned. 10 …to be put into effect when the times reach their fulfillment – to bring unity to all things in heaven and on earth under Christ. There is a balance in Scripture between being chosen in a way which was predestined, and putting ourselves in a place to be chosen, which is our decision (below) to 1. put our hope in Christ, 2. hear the message of truth and 3. believe. 12 …in order that we, who were the first to put our hope in Christ, might be for the praise of his glory. 13-14 And you also were included in Christ when you heard the message of truth, the gospel of your salvation. When you believed, you were marked in Him with a seal, the promised Holy Spirit, who is a deposit guaranteeing our inheritance until the redemption of those who are God’s possession – to the praise of his glory. In practice Paul’s letter to the church in Ephesus is written to a spiritually mature readership. He reminds them of their identity in Christ and their adoption into sonship – with all the connotations of the privileges of a family heir that Roman adoption conferred. But this was living as a believer in a Roman colony of an empire where persecution of those who were Followers of the Way was all too real a prospect and death could be the result. These believers had a real experience of the empowering of the Holy Spirit – and Paul reminds them that the inner witness of the Spirit of God is like a down payment on the experience of heaven. They were to be assured of their destiny, and so are we. p class=”p9″>Question Why does Paul put so much emphasis on us knowing who we are in Christ? Why does this help us to live well for Him?